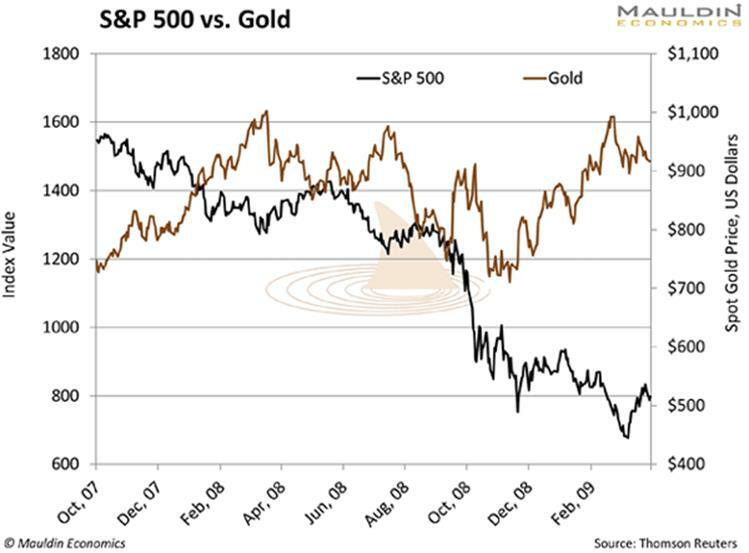 BY ROBERT ROSS : Gold has done well during the latest sell-off in the markets. But it’s not surprising. Gold has always been seen as a safe haven. When the markets tumble, investors flock into this asset. The same happened when the dot-com bubble burst in August 2000 and bottomed in May 2003. Over this period, the S&P 500 lost 46.6% while gold gained 43.4%. Clearly, gold is a great hedge against crises—and even interest rate hikes. But there are little-known stocks in the gold market that often do even better. The best part is they carry less risk. They’re gold royalty companies. And they should be in your portfolio. To build and operate a gold mine is very expensive. A miner might have a promising deposit but lack the money needed to get the gold out of the ground. That’s where a royalty company comes in. The royalty company makes an upfront payment to a mining company and becomes a silent partner. In return, a royalty on the miner’s future gold production is negotiated. A royalty gives the company the right to receive a fixed percentage of a gold miner’s production. These payments typically continue for as long as the mine is active. And that’s good for a number of reasons. The royalty business model is best in that it gives unlimited upside. Gold miners are companies that dig up and sell gold. A gold royalty company doesn’t do any of that. Instead, it provides cash to miners to help them run their business. When the miner sells its mined gold, a gold royalty company gets a royalty—kind of like an interest payment—for the upfront investment. The best part is that when gold prices rise, the royalty payments rise as well. And so do the profits of the royalty company. If the mine grows its gold production, the royalty company benefits without investing any additional money. But there’s another reason to love royalty companies: limited downside. The royalty company is not on the hook for any additional costs. It doesn’t bear any variable costs and risks that come with running a mine. For a gold investor, this is a major benefit over owning a gold miner. See, gold mining is one of the world’s worst businesses. It is a dangerous operation fraught with hazards that a miner can’t predict or control. Environmental activism, political risks, unions, and safety regulations are just part of that list. Royalty companies get the best of both worlds. And luckily for investors, they’ve performed great during the recent stock market sell-off. Of course, gold has performed admirably during the recent sell-off. But it’s been no match for gold royalty companies. Since October 1, gold is up a modest 3.8%. However, the average return for my top two royalty companies was 13.3%. That’s more than three times the return from gold, and with less risk. I should note that I’m not a gold bug. My goal is to find safe, secure investments for my readers. Given its track record and current value, gold— especially gold royalty companies—offers a compelling value proposition. Franco-Nevada is the largest gold royalty company. The Canadian-based firm was also the first royalty company, so it knows a thing or two about the business. The company pays a solid 1.3% dividend yield. And while the stock market was selling off the last two months, shares of Franco-Nevada climbed 13.3%. That’s more than triple the return on gold over the same period. While I like Franco-Nevada Corp., my favorite royalty company is Sandstorm Gold (SAND). Sandstorm Gold is another Canadian royalty company with a portfolio of 185 royalties. This shields the company from any negative fallout should a single royalty go bust. The company’s diverse investments, solid balance sheet, and business structure are why Sandstorm Gold is my favorite royalty streaming company. And it shows in its share price. While the market has been a roller coaster since October 1, Sandstorm Gold was actually up 14.1%. Bottom line: all investors should have some exposure to gold in this volatile market. 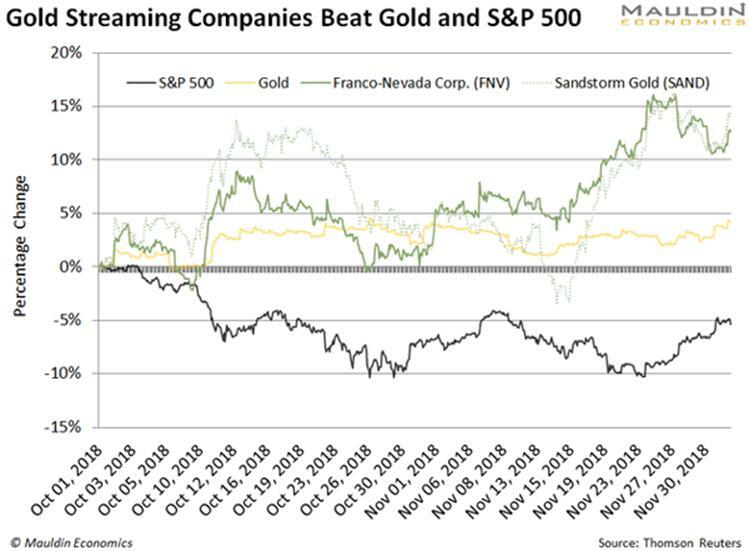 So, if you plan on putting your money in gold stocks, it should be a gold streaming company.